How long to figure this guy is going to live? So I ordered Christopher Bollyn's 3-book series. 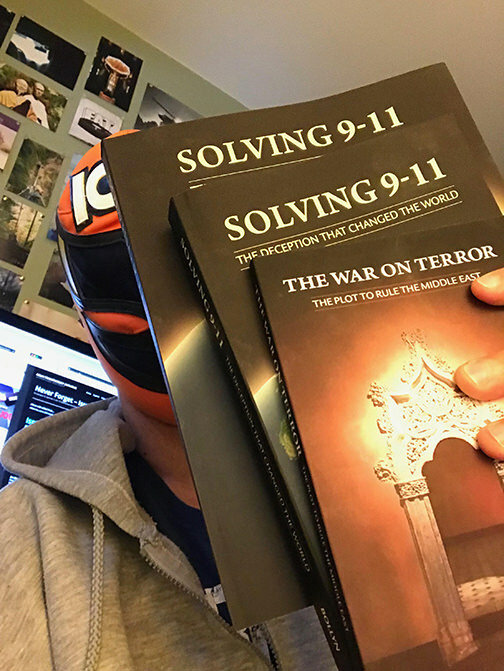 Most excellent stuff, IMHO he has basically solved a majority of serious 9/11 dots. People can argue all day over collapse physics etc, but Bollyn has put together such a solid case full of real names/connections/documents/logic that I really doubt anyone could challenge his conclusions. He has several videos out there covering the basics of his books, I highly suggest everyone watch a few. - a few hours before the Patriot Act was passed, it was edited to make foreign companies in charge of security on 9/11 immune to lawsuits. This would prevent American courts from demanding that ICTS provide testimony or hand over the missing surveillance videos from the airports. - As Pentagon Comptroller, Zakheim is responsible for the disappearance of $2.6 TRILLION, announced by Donald Rumsfeld on 10th September, 2001. - Fired from National Security Council in 1976 due to suspicion of passing classified documents to Israel. Who was Bush Jr's Speech-Writer? - Odigo has offices in New York and in Herzliya, Israel. Herzliya is the location of Mossad HQ. - ZIM, an Israeli company, vacated its office in the North WTC tower a week before 9/11, breaking its lease. - white van parked near the twin towers on 6th and King Street had a mural painted on the side that literally depicted a jetliner crashing into the twin towers and exploding. - police audio transmission indicates that the two suspects in the van started to run away when the van was stopped and were apprehended shortly thereafter in some sort of struggle. - Israelis were held in custody for 71 days before being quietly released. - detailed DEA report documented 180 cases of Israeli art students infiltrating DEA facilities. It provided names, drivers’ license numbers, addresses and phone numbers of the Israelis. - 6 of the students had mobile phones that had been purchased by a former Israeli vice consul in the U.S.
- On December 13, 2001 the EIR’s Washington Bureau Chief Bill Jones asked Colin Powell, There were 60 Israeli citizens who have been picked up in the post- Sept. 11 sweep, many of whom, if not all of whom, are connected to Israeli intelligence. Are you concerned about such intelligence operations on U.S. soil, and have you taken up this issue with your counterpart in Israel? Powell responded: I’m aware that some Israeli citizens have been detained, and I’ve been in touch with the Israeli government as to the fact that they have been detained, in making sure that they have rights of access to Israeli diplomatic personnel here in the United States. With respect to why they are being detained, and the other aspects of your question, whether it’s because they are in intelligence services or what things they were doing, I will defer to the Department of Justice and the FBI to answer that; because, frankly, I deal with the consular parts of that problem, not the intelligence or law-enforcement parts of that problem. - Less than one week before 9/11 several of the hijacker ‘patsies’, including Atta, boarded a Sun Cruz Casino Boat in Florida. Who owned these casino boats? If this is not some empty distraction operation, its pretty cool. AE911 stands for Architects & Engineers for 911 Truth. They are focusing ENTIRELY on the physics of building collapse, especially WTC 7. Now they get to plea their case to a real Grand Jury about whether or not explosives should be suspect in the collapses that day. Of course no MSM org is covering the story, I've heard it boasted that RT is the only major org reporting on it.